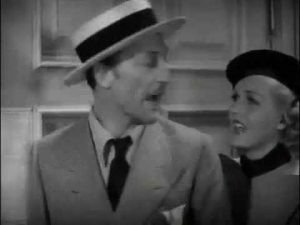 The Case of the Lucky Legs is a 1935 mystery film, the third in a series of Perry Mason films starring Warren William as the famed lawyer. Frankly, I absolutely love Warren William as Perry Mason. He plays the character entirely differently from Raymond Burr’s famous TV role. And I loved it. Here, Perry Mason is a hard-drinking, active, snarky individual. The Curse of the Lucky Legs has a lot of snarky humor from Perry, Della Street (Genevieve Tobin), and “detective” Spudsy Drake (Allen Jenkins). It’s very enjoyable to watch, fast-paced, humorous, and deadly serious when it needs to be. I enjoyed The Case of the Lucky Legs on TCM, and I hope that you do as well. Perry Mason (Warren William, Lady for a Day) – the hard-drinking criminal lawyer. The audience first meets him sleeping off a hangover in his office. Despite that, they quickly learn that he’s more than capable, quick-witted, and active. Della Street (Genevieve Tobin, The Petrified Forest). Perry’s competent, acid-tongued secretary and assistant. She demonstrates her quick wits when she “accidentally” locks four policemen in Perry’s private office in order to take a phone call from him without their eavesdropping. Dr. Bob Doray (Lyle Talbot, 20,000 Years in Sing Sing). Margie’s not-quite-fiancee, who clearly loves her, and is trying to help. But did he kill for her? Spudsy Drake (Allen Jenkins, Five Came Back). Not a private detective, but the man that Perry uses when he needs to find someone. Allen Jenkins plays Sudsy very comically — he’s a sizable component of the fun of enjoying the film. Three Stooges regular Bud Jamison makes an appearance as a bartender, who serves both Perry and Sudsy a tall glass of … milk! Supporting players Barton MacLane and Lyle Talbot would later appear in the Perry Mason TV series starring Raymond Burr. Barton Maclane’s character Bisonette was named Detective Lucas in the previous entry in the series, The Case of the Curious Bride.